In our college, the total no of computer available is more than 200 (With Intel core i7 and 8 GB RAM), total Printer is more than 15 and also provide Microsoft Package Dreams Spark Subscription that contain all Microsoft license software. 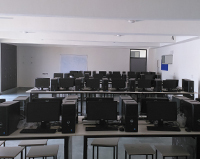 The lab is equipped with 60 computers (Intel Core i7 3.40 GHz processor) along with air conditioners which are supportive enough to the students in doing practical and other research work (also for faculties). These machines are installed with latest licensed software like Microsoft Office 2007, Turbo C etc. In addition, this lab equipped with printer, scanner and high speed internet connectivity. 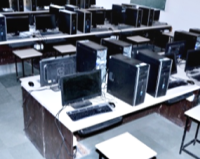 Lab is well equipped with 20 (HP Compaq Elite 8300) Desktop Computers (Intel Core i7 3.40 GHz processor) with licensed Operating System. 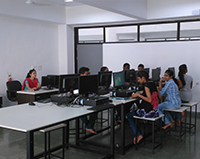 The interactive experiments in this lab, can gives students an opportunity for learning and better understanding of the basic concepts and constructs of computer programming. These machines are installed with latest licensed software like Microsoft Office 2007, Turbo C etc. Lab is well equipped with 24 (HP Compaq Elite 8300) Desktop Computers (Intel Core i7 3.40 Ghz processor) with licensed Operating System. Students learn Operating Systems like Unix/Linux along with programming. 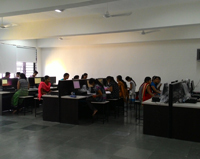 The interactive experiments in this lab, can gives students an opportunity for learning and better understanding of the principles of computer operating systems using a progressive approach and problem-oriented learning. 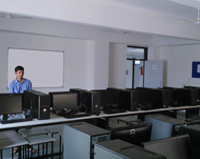 Lab is well equipped with 24 (HP Compaq Elite 8300) Desktop Computers (Intel Core i7 3.40 Ghz processor) with licensed Operating System. Students learn Sequential Query Languages (SQL) along with database tools and Software tools. The lab is well equipped with DATABASE software like oracle10. The interactive experiments in this lab, can gives students an opportunity for learning and better understanding of manipulation of data in a database. Lab is well equipped with 20 (HP Compaq Elite 8300) Desktop Computers (Intel Core i7 3.40 Ghz processor) with licensed Operating System. Students learn languages like C, C++, Java etc. in the lab hours. Lab is well equipped with 24 (HP Compaq Elite 8300) Desktop Computers (Intel Core i7 3.40 GHz processor) with licensed Operating System. The interactive experiments in this lab, can gives students an opportunity for learning and better understanding of designing and analysis to solve the complex problem. Lab is well equipped with 48 (Dell Vostro 3902 Series) Desktop Computers (Intel Core i7 3.40 Ghz processor) with licensed Operating System. Each student must complete a team-driven capstone project in which they design and prototype a product and software system.